Numerous accusations by Washington and its rogue allies about Syria using chemical weapons were fabricated. Earlier, Saudi Arabia was caught red-handed supplying terrorists in Syria with Chemical Weapons (CWs). So was Turkey, discovered shipping toxic sarin gas cross-border. Perhaps Jordan and Israel supplied CWs. Both countries support ISIS and other terrorist groups. Syrian forces never used them at any time throughout years of war. No credible evidence suggests it. Claims made were phony. “The fact is that the western states and regional countries have directly or indirectly supplied banned poisonous substances to militants, terrorists and extremists active in Syria” – along with Western weapons and other material support. Information was “handed over to the United Nations and even made public during bilateral talks, particularly between Russia and the United States,” Zakharova explained. On Wednesday, Syrian Deputy Foreign Minister Faisal Mekdad accused Washington and Britain of supplying terrorists in Syria with CWs, explaining evidence was found in liberated areas by government forces. 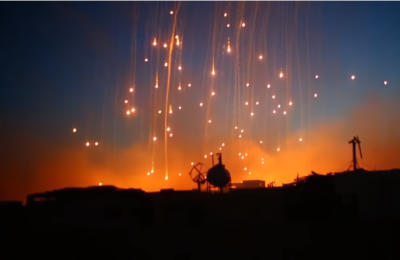 Munitions filled with toxic agents were discovered – produced by the US Federal Laboratories and NonLethal Technologies, as well as Britain’s Cherming Defence. They support the terrorist scourge they claim to oppose, what’s been well known all along, something I stress repeatedly in my articles on Syria. Washington, NATO, Israel and their rogue allies want endless war and regime change, not peace and stability, notions anathema to their diabolical agenda.